Star racecar Lightning McQueen and the incomparable tow truck Mater take their friendship to exciting new places in “Cars 2” when they head overseas to compete in the first-ever World Grand Prix to determine the world’s fastest car. But the road to the championship is filled with plenty of potholes, detours and hilarious surprises when Mater gets caught up in an intriguing adventure of his own: international espionage. Mater finds himself torn between assisting Lightning McQueen in the high-profile race and towing the line in a top-secret mission orchestrated by master British super spy Finn McMissile and the stunning rookie field spy Holley Shiftwell. Mater’s action-packed journey leads him on an explosive chase through the streets of Japan and Europe, trailed by his friends and watched by the whole world. The fast-paced fun includes a colorful new all-car cast, complete with menacing villains and international racing competitors. 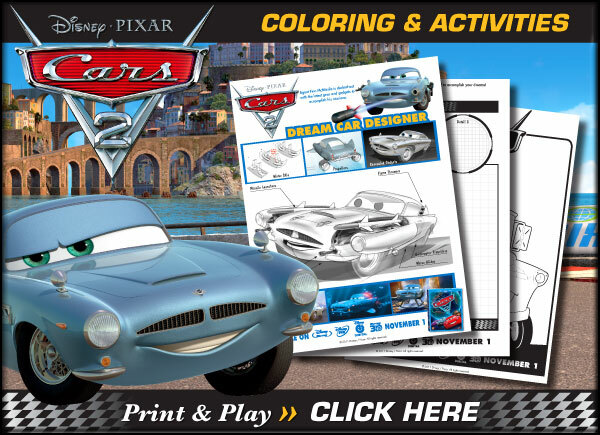 When the first Cars movie came out years ago it became an instant favourite with my boys. They were 3 & 4 years old at the time and it didn't take long for them to have the movie practically memorized. My son Owen has always been especially enthralled. He even used to sleep with his Lightning McQueen cars every night. Needless to say when they heard that there was a Cars 2 they were more than a little excited. We went to see Cars 2 in the theatre in 3D this summer and all three of my kids loved it. 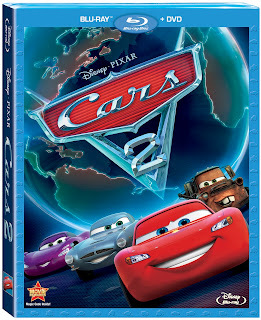 They were extremely excited with the Cars 2 blu-ray DVD combo pack arrived in the mail last week. I am sure we have watched the movie at least a dozen times since it arrived. Aiden (age 9): I like it even better than Cars 1. I like all the race cars. Owen (age 8): I love the whole movie and I can't even pick a favourite part but the part at the end where they let Mater keep the rockets is hilarious. My favourite car is still Lightning McQueen and Mater is still the funniest. Olivia (age 4): I like Holly the girl spy car because she can do anything and even fly. And she is pretty. And she likes Mater and Mater is funny. Aiden: Air Mater is really funny and I can't wait to see the Planes movie too. Owen: Mater got to fly and he is so funny. The Hawaiian Vacation one is funny too when they make a beach out of kitty litter and Buzz is in Spanish mode and Ken and Barbie fall into the snow. Olivia: I like the Hawaii one where Ken and Barbie kiss. I like Barbie. She's pretty. Cars 2 is an all around great movie for kids. It would make an excellent Christmas present as well :).